When you are consistently kind and considerate, in time, the other person gains a sense of safety in the relationship. If the other person doesn’t experience you as kind, he or she may instead feel insecure, needy, angry, standoffish, or uncomfortable in the relationship with you. These other “negative” emotions come into play because there is no sense of security between the two of you. The end result is that the other person will not entirely trust you if you are unkind and whether at home or the office, trust is a fundamental part of all significant relationships. Intimacy and vulnerability occur when we feel that the other person “has our back.” As soon as trust breaks down because of an unkind word or act, we immediately retreat, feeling that the relationship may not be safe or healthy. On the other hand, simple and consistent acts of kindness can bring hope to struggling relationships and enable trust to build over time. "I am going to be kind, not mean or sarcastic" is Step 2 of the Relationship Protocol model. 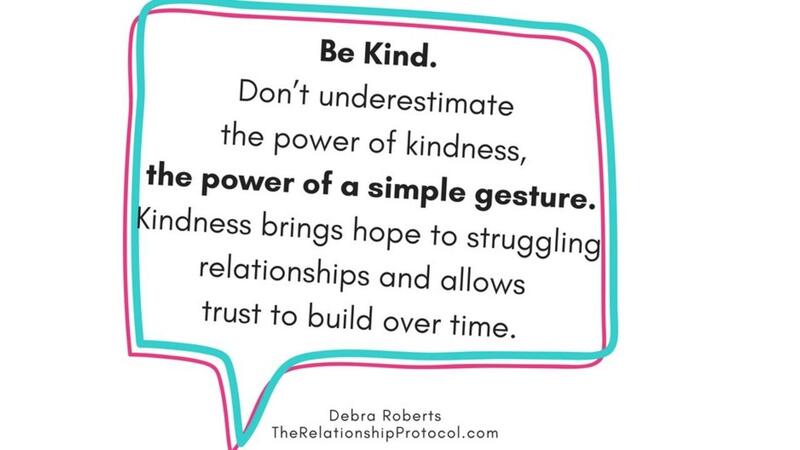 Kindness is a necessary component for healthy relationships to thrive. Caring about how the other person feels is being relational, and because the other person matters to you, you want to treat them well and create a safe environment. Don’t underestimate the power of kindness, the power of a simple gesture.